Staffed by experienced professionals, American Sharpening has built its reputation of excellence through communication, craftsmanship, customer education and trust. Join the growing number of Salon owners/managers, Professional schools, and hair professionals that have turned to American Sharpening for scissors distribution, blade and scissor sharpening, and equipment repair and education. We go the extra mile to provide outstanding customer care and services. We always offer a 100% satisfaction guarantee and fast turn-around times. Minor repair parts when required such as; screws, sockets, bumpers, and tension springs are replaced at no additional charge. It's easy to understand why we receive comments like: "American Sharpening is a refreshing change to the Sharpening Industry". 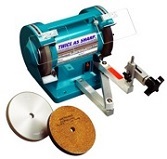 Only the highest quality sharpening equipment and procedures are used in the sharpening process. These sharpening procedures insure that you receive the very best edge attainable, in most instances better than original. Complete repair service for all Oster®, Andis®, Laube®, and Wahl® clippers. Click here for more complete Stylist Services information. Sharpening for all brands of Scissors and Clipper Blades. Complete repair service for Oster®, Andis®, Laube®, and Wahl® clippers. We use only original manufacturer replacement parts and offer a 100% guarantee for 30 days on all labor and parts. Click here for more complete Groomer Services information.